Over the years your skin has gone through a lot, whether it’s harsh weather conditions or products that cause irritation. Skin discolouration, also known as skin pigmentation, is a common phenomenon and most of us don’t know how to deal with it. It causes a lot of psychological distress while some may be a sign of health problems. Factors such as the sun, inflammatory skin disorders, hormonal fluctuations, genetics, are all taken into account while skin discolouration is diagnosed. Experts say that about 80 percent of women are affected by various forms of pigmentation in their lifetime, not to say that men are not. What exactly is pigmentation? It is the changes of melanin, which is the pigment that gives human skin, hair, and eyes their colour. When you have pigmentation, your face appears dull as the skin tone is uneven - whether it’s because of dark spots or acne scars. Many have this idea that pigmentation just refers to dark spots, and that’s simply not true. There are different types of pigmentation and not all respond to the same treatment, that’s why it’s crucial to diagnose them by a certified dermatologist before treating them. Known as a ‘butterfly rash’, melasma is a type of hyperpigmentation that is most common in people that have a darker skin tone. It appears as brown discolouration that’s patchy across parts of the face. It usually occurs on the upper cheeks, but can also appear on the forehead, upper lip and chin area. It is said to affect women more than men. There are three different causes of melasma: pregnancy, hormonal changes and genetics. When it occurs during pregnancy it is called chloasma, and more than 50 percent of women are affected by this. Although, the exact cause of why this happens during pregnancy has not yet been determined by experts - ultraviolet radiation from the sun is said to be a trigger. Let’s get hormones into the mix: medications such as birth control pills make your skin more vulnerable to pigmentation caused by the sun. A good way to prevent melasma is slathering on sunscreen at least twice a day - make sure you choose one with the most protection. Genetics plays a role with this skin condition - if you have a family history of melasma, you are most likely to develop it. Protecting yourself is of utmost importance if you know you are prone to develop it - so please put on sunscreen! 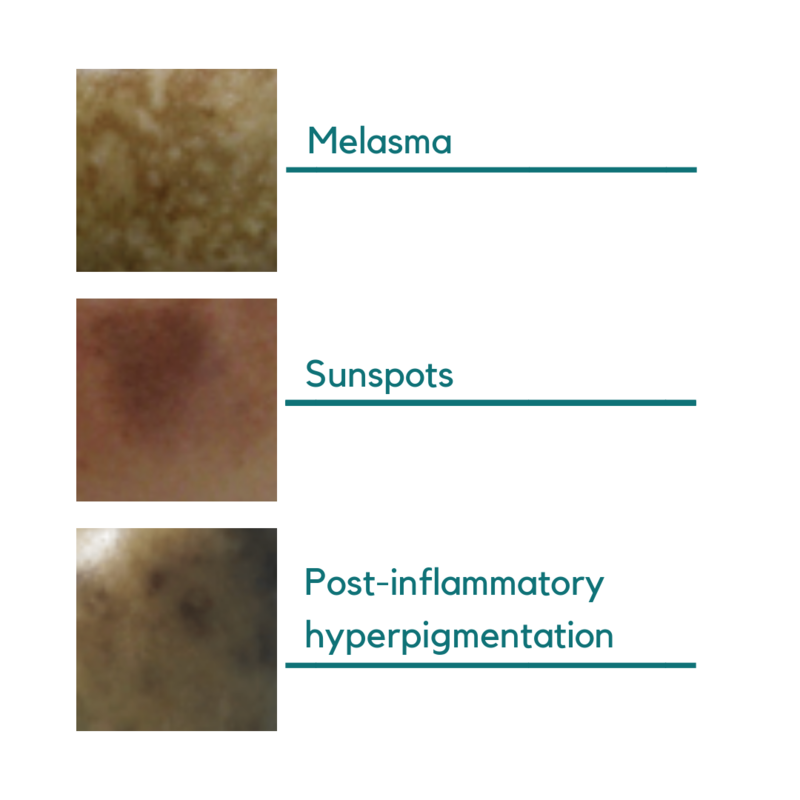 There are different types of melasma which affect different layers of your skin - a dermatologist should be the one to determine the type of melasma you’re experiencing before treatment can be started. Are you wondering if treatment is required? Well, if left untreated, melasma can increase in size and become darker as well. This can cause a dull and uneven skin tone, making the skin look a lot older than it is. Treatment includes various topicals, peels and laser therapy. We suggest you treat melasma if it has been distressing you for years, a dermatologist can definitely help improve your skin’s complexion. Medically speaking these are called solar lentigines, but for the purpose of this blog post naming them sunspots works just fine. They appear to be darker than your skin tone, brown and don’t change the texture of your skin. People that have a lighter skin tone are more prone to sunspots, so if that applies to you, please do take cautionary methods. If not treated, being exposed to the sun can cause the development of more sunspots while making the old ones much darker. Sunspots most commonly appear on areas that are most exposed to the rays of the sun such as your cheeks, cheekbones and nose. This is not to say they can’t occur on any part of the body - if the sun can reach it, it can happen. The causes of sunspots is pretty obvious - yes, you guessed it, the harsh rays of the sun. If you spend too much time in the sun, you are more vulnerable to sunspots. Melanin, the pigment we mentioned above, is present on the surface of the skin. When your skin is exposed to direct sunlight, melanin ends up clumping together - so too much sun, can cause too much of clumping resulting in sunspots that become darker or increase in number. Sunspots are not commonly dangerous but do have the ability to develop into skin cancer in prone individuals - we advice that you get them checked if you get them regularly or they are worsening. Keep in mind this is just a precautionary measure, so do not get worried! By now, you probably understand that preventing sunspots is much easier than most think. Yes, just protect your skin - use sunscreen! This is the discolouration that is left behind on your skin after inflamed wounds have healed or are in the process of healing - hence the name ‘post-inflammatory.’ Acne for example, has a tendency to leave dark spots as it takes weeks, even months, to heal. The marks it leaves behind is what PIH is! Science time! When the skin is trying to heal, it’s creating new skin by the use of proteins called cytokines. The problem is that while all that is happening, cytokines also result in the production of more melanin. More melanin, more pigment → more discolouration -> PIH! Now you add sunlight to the mix, and the dark spots become darker. It is important to take note of the fact that products used on the skin can aggravate PIH. We advise you to go get them checked out by a dermatologist who can then give you advice on the right products to use on your skin - medications or cosmetics. PIH can be treated, but we suggest you use what a dermatologist prescribes, not what your friends or family members suggest. The severity of your condition and your skin type is what determines the treatment of your condition. One treatment does not work the same for everyone! We get it pigmentation can be embarrassing or scary, because all of us would prefer a perfect complexion - but you’re not alone. There is always a right solution that can help cure or improve your skin’s complexion! The key is to get it checked out as early as possible. Please do not self-diagnose or self-medicate, you could make your condition worse. With remedico you can now get your skin condition diagnosed through a consultation right from your phone. You’ll receive a customised treatment plan that is suited to the severity of your condition and your skin type in 24 hours.